Otzma Yehudit infuriated after Ahmed Tibi reveals Arab-Israeli party and haredi factions teamed up to scuttle Muezzin Bill. 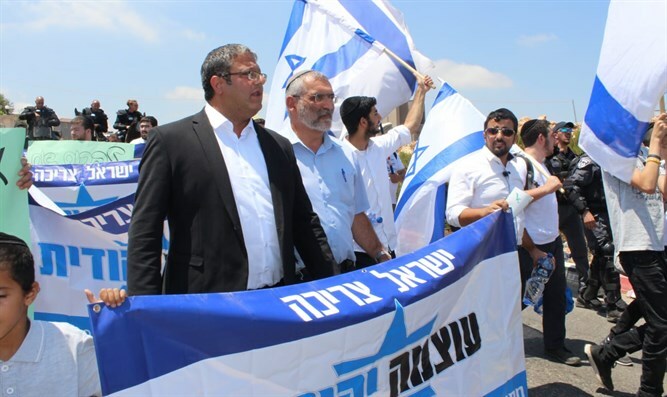 Members of the far-right Otzma Yehudit party attacked haredi lawmakers following Arab-Israeli MK Ahmed Tibi's admission that they scuttled the Muezzin Bill at his request. The UTJ faction had opposed the Muezzin Law, which seeks to limit the use of loudspeakers in mosques at times of the day in which they could disturb residents. "The haredi parties decided to join the PLO representative in the Knesset - Ahmed Tibi, a former adviser to the arch-murderer Yasser Arafat," said Otzma Yehudit leader and former lawmaker Michael Ben-Ari. "This is a disgrace and a process that indicates a lack of a clear ideological backbone, and that these are parties that are motivated solely by interests. This is exactly what is said: 'Tell me who your friends are and tell you who you are.'" "It's painful that a party that a party which says it supports Torah joins up with the enemies of Israel," added Attorney Itamar Ben Givr. "I am sure that the voters for United Torah Judaism (UTJ) Jare not happy about this move to say the least, and I am sure they would have been happy had it had not happened." Baruch Marzel added that "Otzma Yehudit in the Knesset will act to silence and immediately close the mosques in which they incite on a daily basis to murder Jews and show zero tolerance in enforcing the law against the growing bullying in the Arab sector". There had been two versions of the Muezzin Law: One of them, submitted by MK David Bitan (Likud) and MK Motti Yogev (Jewish Home), would prohibit places of worship from using their loudspeakers between the hours of 11:00 p.m. and 7:00 a.m., as well as limit the decibel level of loudspeakers used during the remaining hours of the day. The second proposal, submitted by MK Robert Ilatov (Yisrael Beytenu), completely bans all places of worship from using loudspeakers and levies a fine between 5,000 and 10,000 shekels for each violation. As expected, the bill had been met with great opposition from Arab MKs. MK Ahmed Tibi (Joint List) has called on the Arab public to disobey the law should it pass. Hamas also joined in on the criticism, with its deputy leader Ismail Haniyeh warning the law would face “stiff resistance”.